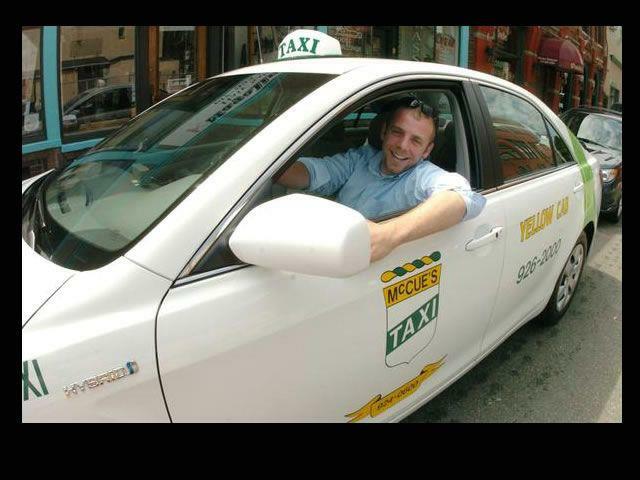 Sean McCue, owner of McCue’s Taxi, sits in a cab in a photo from a 2012 Facebook post. The family-run business closed recently. The Blizzard of 1978 couldn’t stop McCue’s Taxi’s cars from rolling, neither could the Boston Marathon Bombers, or the recent Recession, however the Watertown-based cab company could not survive a new type of obstacle — the online-based ride sharing companies. In late August, McCue’s Taxi closed down operations after more than 70 years. Owner Sean McCue tried to find ways to keep the it going, or merge with another taxi company, but he had no luck and had to close the family-run business. Regular customers began to disappear, McCue recalls, such as those who took a taxi to work five days, or would be dropped off at Logan Airport on Mondays and picked up on Thursday evenings. Towards the end, the most reliable customers were seniors needing rides to medical appointments, or students at Perkins School for the Blind. McCue’s had 21 cars and about 50 drivers (a mix of full and part-time) but by the time the company closed only about 10 cars were on the road. Having to close the business was difficult for McCue, who was the fourth generation in his family to run the taxi company. McCue took over in 2006 and for many years he worked with his mother, who helped with the books. She died unexpectedly in 2016. “She was the backbone of the company with my Dad, and she was the backbone of the company with me,” McCue said. McCue’s is just the latest area cab company to close, after Newton Yellow Cab, Red Cab in Brookline, Hello Taxi in Cambridge and some in Waltham, McCue said. Running a taxi company comes with additional costs and regulations which, for now, Uber or Lyft do not. One major one is that each vehicle have a medallion. These are limited by a town’s population, so Watertown has 32, McCue said, one for every 1,000 people. McCue’s started with around 10 or 12, but through the years his father acquired more, such as when he bought A-1 Taxi in the 1970s and got its four medallions. When it closed, McCue’s had 21 of Watertown’s taxi medallions, McCue said. Medallions could be worth upwards of $750,000 in a city like Boston or New York before the ride share companies, but now are only worth about $50,000 to $60,000, McCue said. McCue’s had to charge passengers enough to cover the driver’s wages, the cost of operating the vehicles (gas and repairs) and insurance, and have some profit for the owners. The ride share companies charge a lot less, but McCue said he does not think it covers even the wear and tear, and gas. “I can tell you how much it costs to run a car, and it’s a lot more than what they pay their drivers,” McCue said. McCue said that the ride-share companies do not have the same regulations as a taxi company, which has to get all its drivers checked by the police and all the meters tested by Town inspectors. He acknowledges that the ride share companies found a new way to run a car transportation company. McCue tried to keep up with technology during the dozen years he ran the company. He added credit card payment machines in the passenger area and recently started a McCue’s app, but he could not compete technologically with the Silicon Valley ride share companies. As late as September, McCue had been looking for a way to get some cars and drivers back on the road by teaming with other cab firms and sharing dispatcher, for instance, or possibly being bought by one, but nothing worked out. McCue said he felt like the taxi company had become part of the Watertown community. Since closing, many people have reached out to McCue. “I have gotten phone calls and emails from people saying, ‘We relied on you to get to the doctor. What are we going to do without you? '” McCue said. For McCue, who has a wife and two young children, it is now time to wind down the business and look for a new venture. He has not decided what direction to go, but said he wants to find an industry that will not become obsolete. Enjoyed working with you in the past. Enjoy your family which is the most important. Wish you all the best. Thanks to McCue’s Taxi for many trips to the airport over decades! Always reliable, always pleasant. Wishing the McCue family and McCue Taxi drivers the very best. My brother Tony always relied on you. Thanks for the memories, and helping those in need. So sorry to see McCues closing up. Sean is a wonderful guy and the company was an institution in Watertown. than those on taxis was a real injustice. I wish you well Sean! So sorry to hear that McCue’s is no more. You’ve been my 1st (and only) choice since I moved to Watertown in 2010. Such nice drivers! Sorry to hear this. .. My family has had so many memories in thst office .. My dad Ernie Richardson was dispatcher for many years and both he and my brother Ernie drove for you .. It’s sad to see but I realize things and times change alot .. We wish you all well in your new endeavours. Sean, I’m shocked and saddened to just hear your news. I know you’ll do amazing things in your future.